The hierarchical internetworking model defined by Cisco includes core layer, distribution layer and access layer. Therefore, the network switches working in these layers get corresponding names like core switch, distribution switch and access switch. This post mainly explores the confusing problem: core switch vs distribution switch vs access switch. Core switch is not a certain kind of network switch. It refers to the data switch that is positioned at the backbone or physical core of a network. Therefore, it must be a high-capacity switch so as to serve as the gateway to a wide area network (WAN) or the Internet. In a word, it provides the final aggregation point for the network and allows various aggregation modules to work together. Similarly, the distribution switch lies in distribution layer, and it links upwards to layer core switch and downwards to the access switch. It is also called aggregation switch which functions as a bridge between core layer switch and access layer switch. In addition, distribution switch ensures that the packets are appropriately routed between subnets and VLANs in enterprise network. 10gb switch usually can perform as a distribution switch. Access switch generally locates at the access layer for connecting the majority of devices to the network, therefore it usually has high-density ports. It is the most commonly-used gigabit Ethernet switch which communicates directly with the public Internet, mostly used in offices, small server rooms, and media production centers. Both managed and unmanaged switches can be deployed as access layer switch. The switches may co-exist in the same network, and coordinate with each other to contribute to an unrestricted network speed with each layer switch performing its own duty. Well, what’s the difference: core switch vs distribution switch vs access switch? Core switch has the higher reliability, functionality and throughput than distribution switch. The former one aims at routing and forwarding, and provides optimized and reliable backbone transmission structure, while the latter one functions as the unified exit for access node, and may also do routing and forwarding. The distribution switch must has large enough capacity to process all traffic from the access devices. What’s more, there’s generally only one (or two for redundancy) core switch used in a small and midsize network, but multiple distribution switches in distribution or aggregation layer. The lower levels the switch dwells in, the more devices it connects to. Therefore, a big gap of ports number exists in access switch and core switch. Most access switches need to connect various end user equipment ranging from IP phone, to PCs, cameras etc,. While the core switch may be just linked with several distribution switches. Meanwhile, the higher layer the switch lies in, the faster port speed it requires. Access switch is to core switch what river is to the ocean, as the latter one has the large throughput to receive the data packets from the former one. Most modern access switches come with a 10/100/1000Mbps copper ports. An example of this is FS S2800-24T4F 24 port 100/1000BASE-T copper gigabit Ethernet switch. While core switches commonly have 10Gbps and 100Gbps fiber optic ports. As access switch is the one that allows your devices to connect the network, it undoubtedly supports port security, VLANs, Fast Ethernet/Gigabit Ethernet and etc. Distribution switch which is mainly responsible for routing and policy-based network connectivity supports additional higher performance like packet filtering, QoS, and application gateways. All in all, access switch is usually a layer 2 switch and distribution switch is a layer 3 switch. 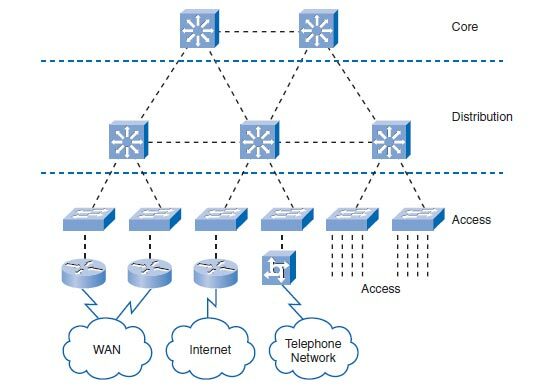 When multiple access switches among different VLANs are required to be aggregated, a distribution switch can achieve inter-VLAN communication. What’s the difference: core switch vs distribution switch vs access switch. To sum up, the access switch facilitates devices to the network. The distribution switch accepts traffic from all the access layer switches and supports more high-end features. And the core switch is responsible for routing and forwarding at the highest level. FS provides different types of Ethernet switches that can work as core switches, distribution switch or access switches. For more details, please visit www.fs.com.